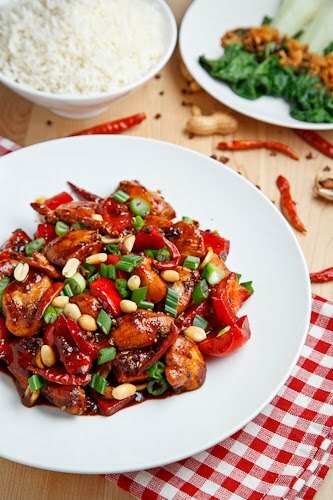 A popular and tasty Chinese sauteed chicken dish form the Sichuan province that uses red chilies and Sichuan peppercorns. With all of this talk about Chinese food it was about time that I got down to cooking some! There are several different types of Chinese cuisine and I would have to say that my favourite is the cuisine that comes from the Sichuan province for its use of chilies and the mouth numbing Sichuan peppercorns . Kung pao chicken is a quick and tasty dish that hails from the Sichuan province and uses both chilies and Sichuan peppercorns and it is a dish that I keep coming back to for more. This recipe is really easy to make though some of the ingredients may not be in every pantry. Although you can replace some of the ingredients with more commonly available ones, I recommend that you try to track down some of the Sichuan peppercorns as they really bring a lot to the table. This is mainly a meat dish that is intended to be served with other vegetable dishes but you can easily add some extra vegetables to the chicken and quickly stir fry them as I did this time with a red bell pepper. This time I also served the kung pao chicken with some steamed baby bok choy in an ouster sauce with fried shallots . Mix the soy sauces, Chinkiang, broth, sugar and corn starch and set aside. Heat one tablespoon of the oil in a pan over medium-high heat, add the chicken and saute until just about cooked and set aside. Heat the remaining oil in a pan over medium-high heat, add the chilies and peppercorns and saute until fragrant, about a minute. Add the sauce mixture, bring to a boil, add the chicken, green onions and peanuts, remove from heat and stir in the sesame oil. Note: If you are new to Sichuan peppercorns you might want to start with 1 teaspoon and build up to the full tablespoon that I go with. Hey Kevin. Glad to have found another food blogger from Toronto! Been scanning through your site and I love it! This kung poa looks like a great dish! It is one of my favorite chinese dishes, especially with lots of chilies! I am hoping to do some chinese food for chinese new yew next week, likely gonna do some turnip cake! YUM! Oh a Chinese classic! and best of all, you did it so well-not the heavy oily salty version! You put the "POW!" in Kung Pao Chicken. That's a LOT of red peppers! I've always wondered if I could make it and if it would taste the same as the one in chinese restaurants, it looks pretty good I will sure give it a try! Congratulations on getting Blogger's Blog of Note! I love your blog! This food looks amazing! Oh that looks so good! A fatastic dish. I don't think I've EVER seen a kung pao chicken that isn't SMOTHERED in oil…but you've done it! I can feel the heat and the flavor from here! mouth Numbing? Yikes. Still sounds amazingly flavorful! You're making me so hungry! This looks so good!! I can't wait to go to the Chinese store here and get some rice wine vinegar and Sichuan peppercorns. Thanks for sharing and would love to add your blog to my list of go-to blogs. Congratulations on being honored as a Blog of Note! I hope to have the same badge on my vest someday. Interesting recipe on kung pao chicken. I was searching for it. I will try making it soon. Regards from NJ! I loooove Kung Pao Chicken and I'm looking at all the peppers and thinking that it must have been fire. Wow ~ this looks so fabulous! I am copying the recipe and hope to make soon! I love Chinese, I think I will try to cook this – it will be a first for me. Chinese new year is near! What a fun and bright dish this is. Congrats in making it to the blog of note! Wow, this recipe looks fantastic! Thanks for sharing. I love chicken dishes. It's delicious food,I like it. Looks and sounds delicious!!! Thank you for sharing!! I make a version of this that is a little heavier on the oil. I am going to try this one next time! just found your post I am from the area too, I will be following you now, I know how hard it is to work with a small kitchen. Oh! I haven't done a lot of Chinese cooking, though I love to eat it! I especially like spicy, yet not oily, food. I will definitely have to try this! This food looks so good. I am hunger now. One of my absolute favorite Chinese food dishes. I'm definitely giving it a try at home! Looks amazing. Definitely one of the classic Chinese dishes. Definitely have to come back to this site and check out more recipes. You are a true talent, Kevin. Every time I visit I think you have outdone yourself. Great photo! 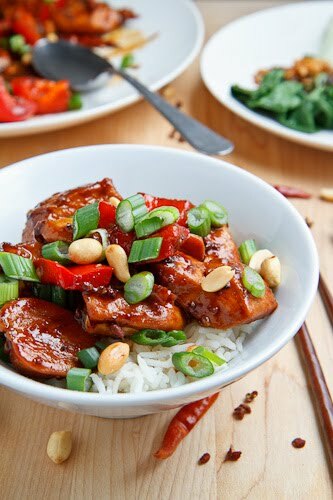 I have never tried Kung Pao chicken, but this photo makes we want to try it! I made your Kung Pao Chicken as well as your dumpling recipes last week for a dinner party. Both were a hit!! Thanks for sharing these! My husband loves kung pao chicken. I will make this for him! made this tonight, WAY to salty (and i am known for over-salt everything!! ), and really gritty? are sechuan peppercorns suppose to be like eating sand? was i supposed to grind them after toasting them? Anonymous: This dish is not a salty one and I am not sure why yours came out so. I kind of like the texture of the Sichuan peppercorns but if you do not you can do one of two things: 1. As you say, grind them, but there will still be a bit of a gritty texture. 2. Saute them in the oil that you will be cooking with and then remove them from the oil before continuing. This will impart some of their fragrance and flavour to the oil but it will not be nearly as strong. Thanks so much for the Kung Pao chicken recipe. This is exactly what I wanted to make tonight. Have been looking for a authentic Gongbaojiding recipe for quite some time. Tried this one tonight, it's great, thanks! is it compulsory to add shaoxing wine or dry sherry in marinade? i want to avoid this as we are non alcholic family, any other substitution or suggestion for this. Anonymous: Yes, you can omit the shaoxing wine in marinade! I have made this several times with the peppercorns and while I do think it is a very interesting and delicious flavor, it is a bit much at times. Perhaps this is because of the size of the whole peppercorns? I have given some thought to smashing them up into smaller pieces or even grinding into a powder to more evenly disperse the flavor. Any thoughts on this? Thanks! I love it!! asphyxia: Yes, it is better when the peppercorns are ground!